Don't tell me there aren't pearls in the projects. Don't tell me diamonds can't form in the hood. Who would've known years ago, little Sonia Sotomayor, a Puerto Rican girl from the projects in the Bronx, would be tapped a Supreme Court Justice. Little Sonia Sotomayor, who lost her father at an early age, was raised by a mother working two jobs and loved reading Nancy Drew books has "editor of the Yale Law Review" on her resume. Wow, the first Latina to possibly sit on the U.S. Supreme Court. This is not just the American Dream but the Urban American Dream. I became a little emotional watching Judge Sotomayor accept President Obama's nomination. She's like me and other people in the ghetto--poor, brown and raised by a single mother. 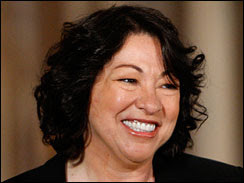 But Judge Sotomayor didn't allow the stigmas of her race and class stop her from getting the black robe. I bet she is who she is today because someone, whether it was her mom, family or teacher, believed in her. And she believed in herself. There are so many poor, black and brown children in the hood who have the potential to be judges, doctors, scientists, writers, artists, philosophers, etc. but aren't encouraged to excel. I can't blame it entirely on our poor public schools or society. Even if some of these kids don't have the money for good schools, some parents still don't work with their kids to find a way to success. Take them to the library, find mentor programs, get on the bus and take them outside of the hood so they can see there's a whole world out there. We'll spend money on our hair, nails, sneakers, clothes but we don't invest in our children. I remember one of my journalism professors told us about a story she did on a group South LA kids who were going to the beach for the first time in their lives. Why? Parents can take the bus to the beach and you don't have to spend money once you get there. There are kids in my hometown of Oakland who've never been to San Francisco. That's a quick train ride and there are plenty of places kids can see in San Francisco for little to no cost. Then there's the issue of killing our kids' self-esteem. I get so mad when I'm in the mall and I hear SOME sistas swearing at their children or calling them "lil' ni**a" or yelling at them "get your black a** over here!" All that does is devalue their worth and then they grow up to internalize it. Who knows what gifts that kid possesses. No wonder so many of our kids are angry and don't believe in themselves. They've been told from the beginning they're not worth anything. Once again, all black parents don't do this, but there are some. Another reason I got emotional watching Judge Sotomoayor is because it made me think of a high school senior who was murdered in Compton on Sunday. Dannie Farber Jr., 18 was eating at a fast food restaurant with his girlfriend when some guy walked into the place, shot the brotha four times and took off. Farber was a good student and had a college football scholarship. Nobody knows why he was killed. All of the potential he had to do something incredible with his life, gone. A diamond from the hood and somebody stole his life. I don't mean to put a damper on this historical moment. But we need to uplift our children. Our words or actions may inspire a future U.S. president or college professor. Just because someone is poor, black, brown and from the hood doesn't mean achievement is impossible. Judge Sotomayor is an example of that. We as a people must think bigger and dream bigger. Tell me what you think about Pres. Obama's pick or the murder of Dannie Farber. You can make up a name, use your real name, be anonymous. Speak your mind. I was so excited I could scream. I'm a black woman, but I am thrilled for the Latino community, and for the nation. We need more diversity in the highest court in the land, and it's a long time coming. Her record on judiciary matters is exemplary, and the fact that she was a trial judge was a feather in her cap. The murder of Mr. Farger is troubling, and the rate that young black males are murdered in this country is frightening. There's a tremendous amount of self-hatred, and low self esteem, which can be a deadly combination. We must teach black males when they're young, that they are worthy, and can aspire to be anything in life with hard work and perseverance. No wonder the prisons are full of the poor black and latino males. It's a disgrace the way we discriminate against the poor.